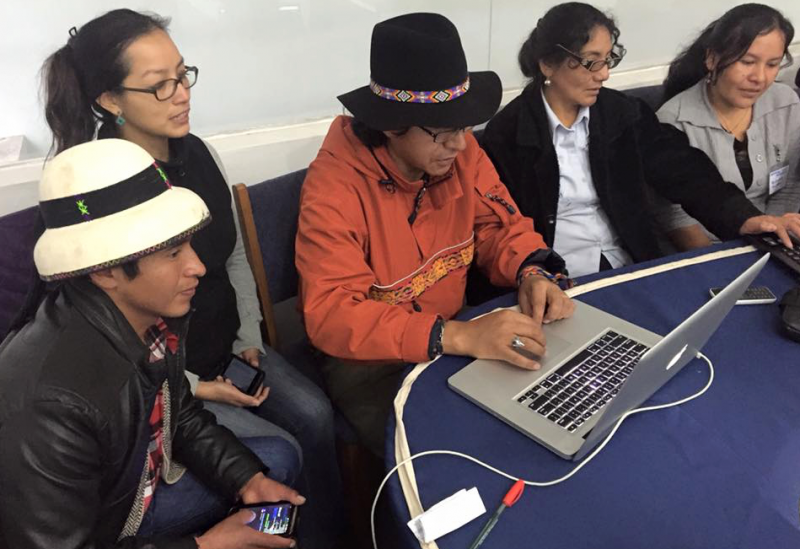 Training workshop at Indigenous Language Digital Activism workshop in Cusco, Peru. Rising Voices is pleased to announce this year's microgrants awarded to five indigenous language digital activism projects in Argentina, El Salvador, Mexico, and Nicaragua. As part of our work supporting initiatives using digital media and the Internet to revitalize and promote native languages online, we launched an open call for proposals in late 2015 inviting communities to submit their ideas for digital activism projects. As a result, we received 63 proposals from 12 countries across Latin America, each with a unique proposal to teach their local communities how to take advantage of digital tools to promote their native languages, as well as to address a specific related challenge. Applicants were also invited to share their ideas on how they would work towards achieving a greater impact employing online and offline advocacy strategies. Communities were asked to share their proposals through the Activismo Lenguas site, where other applicants and network members were able to leave comments, provide feedback, or share words of encouragement. One of the site's objectives is to facilitate connections between communities from the same geographic location, speaking the same language or using similar digital platforms. Following a thorough review and selection process that included the participation of many members of the indigenous language digital activism network, five projects were chosen to receive microgrant funding and mentoring, beginning their project in early 2016. These grantees will share their work on the Activismo Lenguas site and on Rising Voices through regular blog posts highlighting their progress. Another important element of this project includes the connections that will be facilitated among the grantees themselves, but also with the wider network for peer mentoring and other technical support, as well as amplification and translation of their project. Various collectives and organizations such as Kom Kim Mapudunguaiñ Warria Mew, CEPPAS, and Mapuexpress will train Mapuche communities in Buenos Aires how to create audio documentaries focusing on poetry and music, as a way to highlight the need for Mapudungun language revitalization in migrant urban communities. A collaborative project between the Salvadoran National Coordinating Indigenous Council (CCNIS, for its initials in Spanish) and local indigenous leaders will teach Lenca and Kakawira youth how to develop digital multimedia educational materials in the Potón and Pisbi languages to help raise awareness of the current state of these languages. Miskito and Mayangna indigenous students attending a leadership school of the University of the Autonomous Regions of the Nicaraguan Caribbean Coast (URACCAN, for its initials in Spanish) in Puerto Cabezas will learn how to create videos, blogs, and work collaboratively on an online dictionary, exploring ways that students at the university can be a driving force to encourage others to learn or maintain their native languages. Four women in the state of Tabasco have been working tirelessly to teach others the Yokot'an (Chontal) language through classroom teaching. Now they would like to bring this outreach work to the digital world through workshops to create an online radio station broadcasting in the Yokot'an language, as well as produce audio podcasts with health and educational messages for the community. Students of all ages in San Luis Potosí will be invited to take part in this project to work with the Tének (Huastec) language on the Internet. By reaching out to students with technology, there is a better chance to pique their interest in retaining their language. The students will be shown how to create short audio clips and make illustrations to narrate video stories. Please join us in welcoming these new projects, and keep an eye out for updates and self-introductions from each projects very soon.